At SLI we don’t just ask questions, we investigate! 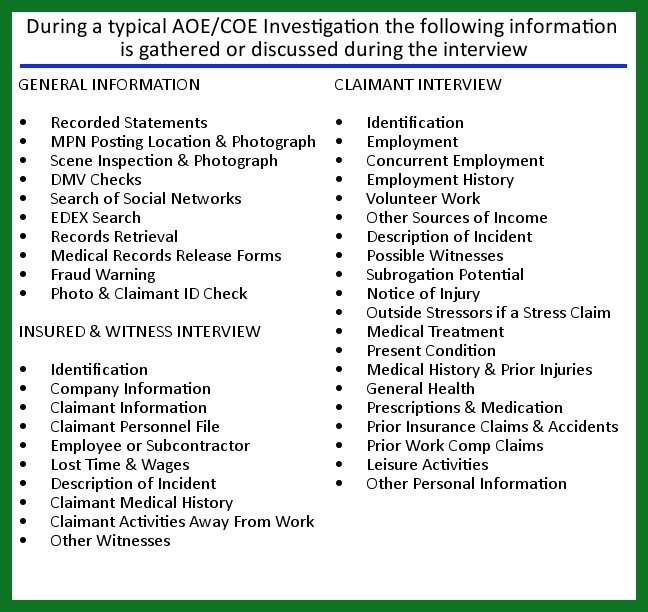 An AOE/COE investigation is requested to determine the facts surrounding an alleged injury and is often the most important aspect of a worker’s compensation investigation. Great care must be taken to ensure that the investigation is not only thorough, detailed, and professional, but also completed in a timely manner in order to meet a legislatively mandated time frame. SLI’s goal is to provide our clients with the comprehensive information they need to answer the big questions. All SLI investigators are trained in a unique SLI AOE/COE investigation methodology. The SLI approach to AOE/COE investigations is built on the core belief that every worker’s compensation claim is unique and that a cookie cutter approach will not provide the best results. This provides our clients with a thorough and comprehensive investigation. Reports are clearly written, very detailed and completed in a timely manner, thus providing the adjuster with all the information they need to make the right decision. Was the alleged injury work related and did the injury occur during the course and scope of employment? Let SLI provide you with the answers!